Forests, clearings, fields, roadsides; occasionally in moist soil. Plants with a very few stalked glands on some pedicels may demonstrate influence from R. allegheniensis. This complex is here restricted to plants similar to R. allegheniensis but unarmed or nearly so, glandless, and with foliage nearly or quite glabrous. Plants once associated here but with pubescent leaves have been shifted to the R. pensilvanicus complex. Plants with a tendency for the canes to trail and root at the tip have been shifted to the R. flagellaris complex. MICHIGAN FLORA ONLINE. A. A. Reznicek, E. G. Voss, & B. S. Walters. February 2011. University of Michigan. Web. 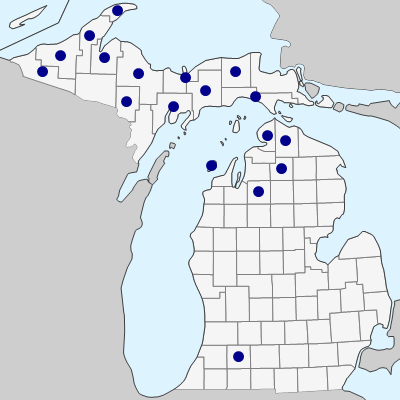 April 21, 2019. https://michiganflora.net/species.aspx?id=2555.